This multipurpose template measures angles, grooves and diameters of most construction fasteners and materials. 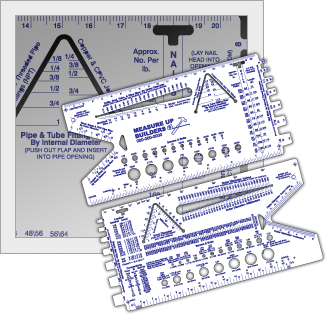 This part contains cutouts in varying sizes of circles for measuring diameters of bolts, screws and other types of fasteners. There is a bolt gauge along the side and a v-cutout for measuring depth and inner diameters. There is also a slot for measurement and various conversion charts. 4.25" x 8.68" x .030"